Abu Dhabi, UAE 24 March 2019 – Under the patronage of His Highness Sheikh Abdullah Bin Zayed Al Nahyan, Minister of Foreign Affairs & International Cooperation and Chairman of Emirates Foundation, and in partnership with the Ministry of Education and attendance of His Highness Sheikh Rashid Bin Humaid Al Nuaimi, Chairman of Ajman Municipality, 2019’s final Think Science Fair took place in Ajman University, the host sponsor in Ajman, with the participation of 160 contestants from across schools and universities in Ajman and Umm Al Quwain. Over 1500 visitors attended the concluding Think Science Fair in Ajman, following the Fairs conducted in each Emirate, raising the total number of Fair visitors from across the UAE to 28,000. 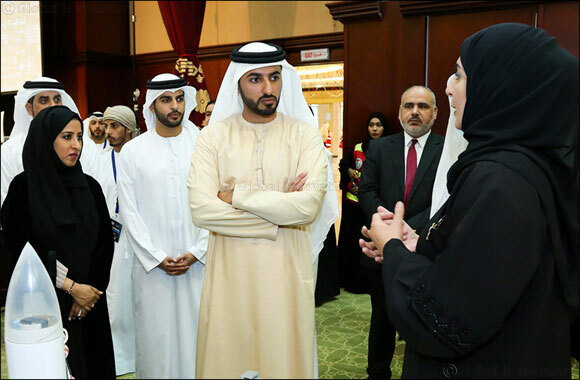 Under the theme of “Seven Fairs for Seven Emirates,” Think Science Fair expanded this year to get closer to youth across the nation and provide everyone with access to the competition. The 2019 Think Science editions, starting with Dubai and Abu Dhabi in February followed by Sharjah Ras Al Khaimah, Fujairah, and concluded in Ajman and Um Al Quwain. This year’ Think Science competition recorded an exceptionally high number of 4,000 applicants and 2,040 projects, out of which 700 qualified as finalists’ projects representing the work of more than 1850 youth from schools and universities from across the UAE. The participating projects have entered the competition under the guidance of 450 mentors and supervisors from educational institutions across the UAE. The judging committee for the competition, made up of more than 81 scientific experts and PhD holders from universities, as well as government, and private corporate entities — who reviewed and evaluated the projects in each Emirate to determine the winners within each Emirate. Winners will then be recognized at the award ceremony, which is due to take place in April 2019. Maytha Al Habsi, CEO of Emirates Foundation expressed her gratitude for the Think Science Strategic partners for their visionary support to the Science, Technology and Innovation Policy and Empowerment of Youth in STEM across the nation. More than 50 partners from private and public sectors, academia and industry delivered hun-dreds of science activities and workshops within their stands at the Think Science Fair 2019. The Fair is supported by Emirates Foundation’s strategic partners; Occidental Petroleum, Total and ADNOC. The Energy partner the Emirates Nuclear Energy Corporation, and other Fair sponsors and partners including Abu Dhabi Islamic Bank, British Petroleum, Dolphin Energy Limited, Hamdan bin Rashid Al Maktoum Foundation for Distinguished Academic Performance, PepsiCo, UAE Space Agency, Honeywell, and Etisalat the digital partner. First Place for each university category; Think Science People’s Choice Award 2019, which is chosen by visitors voting live in each Emirate; Think Science Outstanding Display Award 2019 in each Emirate. In addition, and for the first time, this year’s competition will introduce the “National Geographic Kids Abu Dhabi Special Award focused on the Smart Systems and AI category with a trip to Nasa in the United States. Lastly, an award will also be introduced this year for schools and universities with the highest number of participating projects. Think Science comprises three interrelated projects designed to help realize the potential of the UAE youth in the field of science – Think Science Competition, Think Science Connect and Think Science Ambassadors. Launched in September 2012 and targeted towards young people between the ages of 15 and 35, the Think Science Competition; set up to explore scientific talents in UAE and seek to encourage creativity and innovation, with an ultimate goal of attracting more youth to work in various fields of science .The Think Science Fair, a key component of the program, aims to inspire, encourage and empower Emirati youth to follow their passion for science with interactive, hands-on activities in the fields of engineering, energy, aviation and other technological industries. Think Science Connect is a platform for young people to meet with leaders and prominent figures from various scientific sectors to learn about potential career opportunities and explore projects’ incubational opportunities. This event is held in conjunction with the Think Science Competition at the annual national Think Science Fair. Think Science Ambassadors aims to provide youth who had previously participated in the Think Science Competition with that critical spark by introducing youth to role models in the field, connecting them with mentors, and exposing youth to different extracurricular activities in science.